While living in Cincinnati, Traug Keller frequently headed south to nearby Kentucky to pursue his hobby. 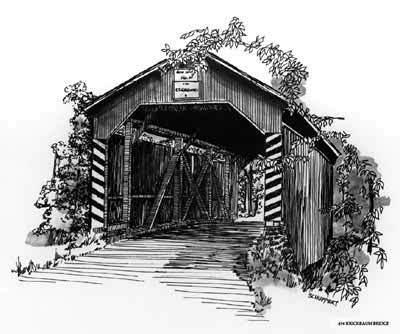 A covered bridge on Kentucky 13 at Jackstown, Bourbon County, over Hinkston Creek. Built in 1877 by Robert Ford and Clay Johnson. 150 feet long; Howe Truss style. Photographed March 7, 1953. The bridge is now gone. Covered bridge in Bourbon County, Kentucky on country road between North Middletown and U>S> 227. Second bridge west of North Middleton. 34 feet long; Queenpost Truss style. Photographed March 7, 1953. The bridge is now gone. Interior shot of the bridge pictured above. Another exterior of the bridge pictured above. A covered bridge in Fleming County, Kentucky, just off State Route 111 between Poplar Plains and Hillsboro. Length approximately 50 fet. 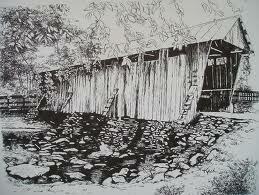 Constructin similiar to bridge in Bracken County. Photographed November 2, 1952. The bridge is now gone. A covered bridge in Fleming County, Kentucky on Kentucky Route 158 at Ringo's Mill. Length of 84 feet. The bridge is still there, though it was bypassed in the late 1960's. Another Fleming County covered bridge on State Route 111, three miles south of Hillsboro over Fox Creek. Known as the "Grange City Bridge," it was 84 feet in length. Photographed on November 2, 1952. An old native stated to Mr. Keller that "it must be 100 years old." Probably constructed in 1865. The bridge is still there, but was bypassed in the late 1960s. Covered bridge over the Licking River at Sherburne in Fleming County. Howe Truss reinforced by a modern, elaborate suspension system. Two spans 158 and 105 feet in length. Photographed March 21, 1953. The bridge is now gone. An interior shot of the bridge pictured above. A covered bridge known at "Bennett's Mill Bridge" over Tygart's Creek in Greenup County, Kentucky, just off Kentucky State Route 7. Taken Sunday morning, November 22, 1953 - one decade to the day prior to the loss of John F. Kennedy, incidentally. It was the only remaining example of the unusual "Wheeler Truss." This bridge was torn down and rebuilt in 2003, with mostly new wood. The interior view of the bridge pictured above. A covered bridge in Lawrence County, Kentucky over Blaine Creek, 2.7 miles south of Fallsburg, to the Gulf station on top of hill, then 180 degrees right, 0.7 miles to the bridge. Photographed November 21, 1953. The bridge is now gone. The interior of a covered bridge over the Dix River hear Hedgeville in Garrard County, Kentucky. Photographed on October 6, 1952, characterized as a "dark and rainy day" by Traugott Keller. An H. Price carved his name in timber on March 24, 1887. All joints wood dowelled. No modern supports. Horizontal siding practically all missing. The last remaining example of the 1958 patent truss by Lt. Col. Stephen H. Long. His 1830 patent was quite different and has several existing examples. The bridge is now gone. Covered bridge over Licking River on U.S. 62 at Claysville, Harrison County, Kentucky. Two spans totaling 300 feet in length. Howe Truss. Built 1874. Long flooring on edge. This bridge was lost to fire in the 1950's, though the piers remain. Photographed on October 18, 1952. The bridge is now gone. 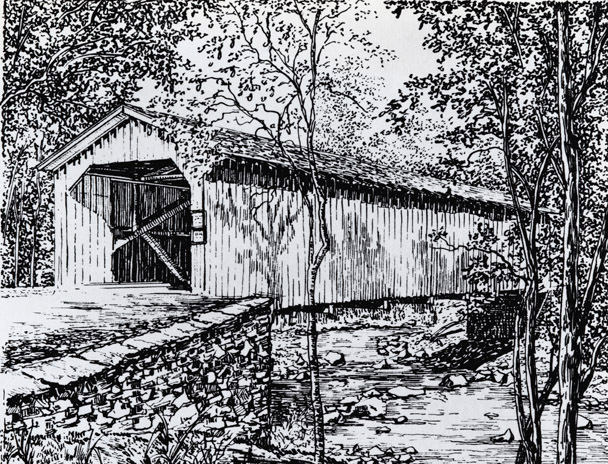 A covered bridge known as the "Wolcott Bridge" in Bracken County, Kentucky over Locust Creek, north of Brooksville. on county road between Bladeston and Wellsburg. 70 feet in length. Photographed October 18, 1952. This bridge may have been rebuilt in the ensuing years with completely new timber. A covered bridge of Lick Run on Kentucky Route 8, about 1 mile east of Dover in Mason County. Length is 62 feet. Photographed on March 28, 1953. The bridge is still there, though Route 8 now passes about a half mile to the north. A covered bridge in a magnificent setting over Eagle Creek at Natlee on a county road southwest of Corinth, in Owen County, Kentucky. Photographed on April 25, 1953. Three spans with a covered approach 39 feet in length. Main span 123 feet in length, Howe Truss. Opposite approach 45 feet in length. Date carved was 1893. The bridge is now gone.